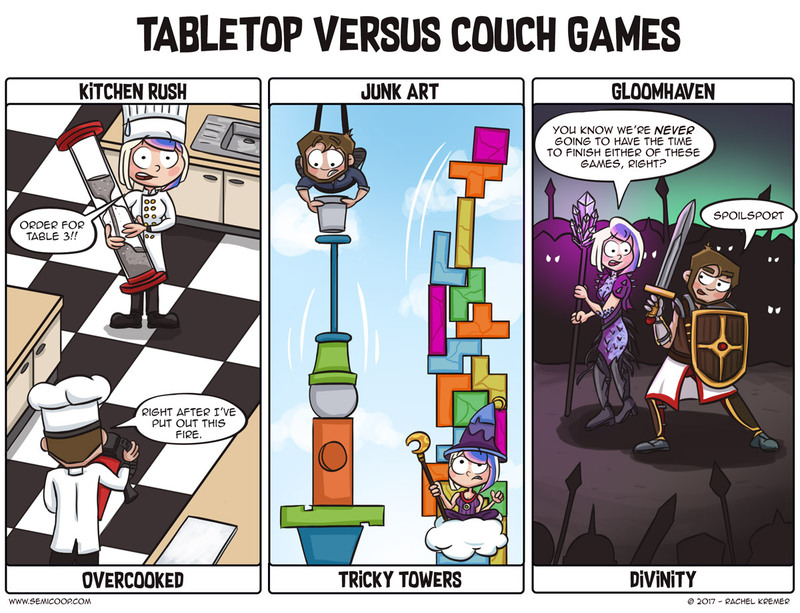 Tabletop VS Couch Games! published on December 11, 2017 Rachel6 Comments on Tabletop VS Couch Games! Digital and analog games aren’t that far apart and are sometimes really much alike in theme (and also in gameplay, sort of). So we have some tips if you love one of the listed games above! If you like Kitchen Rush, you’re bound to like the digital game Overcooked. It’s a hilarious frantic co-op game in which you have to prepare and serve meals as fast as possible! … Oh wait, that’s the same as Kitchen Rush, right? Correct, only without sand timers and more fire! 😉 If you like Junk Art: try Tricky Towers, a great Tetris stacking game… with physics! And if you like the never-ending storyline of Gloomhaven, Divinity is right up your alley with about 100 hours of gameplay. And you get to talk with cats and other animals. Do you know more digital and tabletop games that are almost the same? Thanks for featuring Junk Art! It’s such a great game! Thank you for unleashing the awesomeness that is Junk Art upon the world!